♥ You will receive two wristbands: a children's bracelet and a ladies' bracelet. ♥ With 2.5 cm extension chain so that your girl for about two years has fun with her bracelet and a good fit. ♥ AAA grade gem (5 to 6 mm), the highest level of quality with the best shine. ♥ Luxury wrapped in pink silk sieradenbuildeltje second, equally ready to give away! Because of its shape and inscrutable luster true pearl in many cultures as a symbol of eternity, wisdom and beauty. Beads are formed on the inside of shells in response to a piece of sand which penetrates the shell. It is estimated that 1 in 15,000 wild oysters is a pearl, therefore nowadays almost all cultured pearls. For this jewelry line we use AAA grade, the highest grade freshwater pearls with the most beautiful shape and shine. 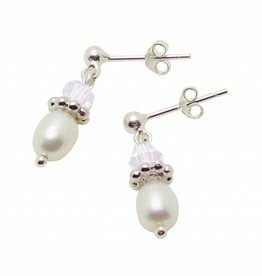 These earrings are true ceremonial pieces: Glistening white pearls on sterling (.925) silver buttons. White Swarovski and silver rings make it complete. Perfect for a silver armandje 'Sparkle'.